In all experimental technologies there are set backs. Things that go wrong. And neurology is such a difficult science. But we may never know what happened to the other McClaine children. Not that it matters, because they were all adopted. No one will miss them if the experiments don’t work. Of course, the Brain Impulse Galvanoscope Record and Transfer (BIG RAT) system had been developed to a reasonable function by the time it was applied to nine-year-old Joseph but the effects of repeated applications remain unknown. Deploying the subject in the field for espionage missions may also curtail the opportunity for further examination. And they complain about 16-year-olds joining the Army. Chances are, vagaries of regional differences in ITV networking notwithstanding, that 50 years ago today, 29th September, 1968 I was watching the debut of a new Supermarionation series, Joe 90. Problems with the ethics of brain salad surgery and child spies were not really at the front of my mind as Gerry Anderson’s latest series hit the screens. The main character, Joe McClaine was a nine-year-old boy. His adoptive father, Professor McClaine had invented a system where the brainwaves of experts could be recorded and then transferred to his ward. Expensive tech, but luckily the Prof can rent his lad out to Sam Loover of the World Intelligence Network (WIN). As long as Joe kept his glasses on he could be a surgeon, an astronaut, fighter pilot, bricklayer, or commando. Joe does manage to come back alive in all 30 episodes. Quite why he is Joe 90 depends on who you talk to. Is it because he is a nine-year-old? Or WIN’s 90th agent? Or because the BIG RAT is catagorised in File 90? The show was set in an unspecified future where the Cold War is back in sway. Despite the flying car, it was not the usual hundred years ahead that characterised Xl5, Stingray, Thunderbirds or Captain Scarlet. They never directly say when it is set but some episodes have calendars or newspapers that imply it is around 2013. Presumably Joe will soon be a spotty sixteen year old. For a brief period, I was a rabid Joe 90 fan. Wanted the Sugar Smacks, Dinky models, the toy gun and suitcase, the badge, the annual, complained vocally when Father Christmas’s helper at the department store in Dartford wasn’t Joe 90 (“It ‘s just a man dressed as as Joe 90 - and he’s older.” Sure I saw him blush.). Dare I say, the best thing about Joe 90 is the opening sequence, the twangy Barry Gray theme tune coupled with not-quite-psychedelic sharp cuts to the tapes and spinning parts of the BIG RAT as it brainwashes Joe for the latest adventure. I can watch that clip endlessly, but the stories themselves lack the pizzazz of Stingray, Fireball XL5 or Thunderbirds. Keep meaning to try and rewatch one where Joe and his Dad have the same dream after a BIG RAT experiment. 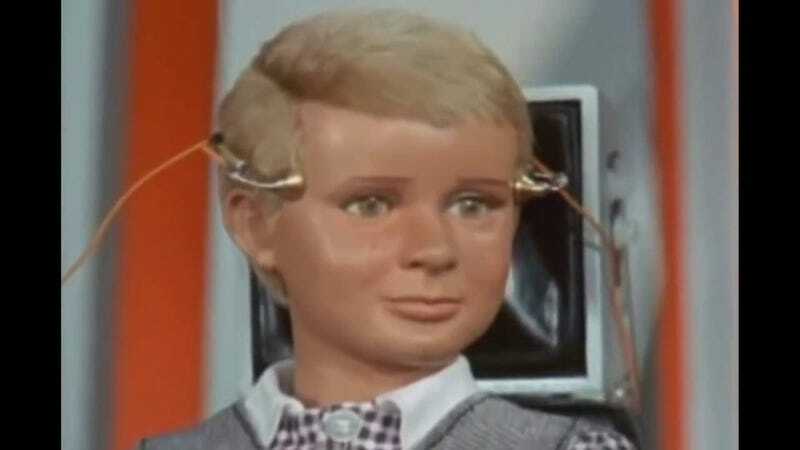 As Anderson shows go, Joe 90 didn’t capture the zeitgeist with the same fervor as his other shows. It also has a weird place in the unraveling of TV Century 21. For some reason it didn’t take up residence in the Anderson comic weekly. Eventually, the Most Special Agent got his own comic - Joe 90: Top Secret - which is mainly remembered these days because the centre pages were given over to something called Star Trek (what the heck could that be?) and it also had Land of the Giants and The Champions vying for our attention. Joe was the lead feature but wound up in black and white in his own mag. After 34 weeks, the comic was merged with TV21 which started a new series. The pages started to get smaller, the Anderson features began to disappear and it morphed into a vehicle for Marvel reprints. It was a strange death.